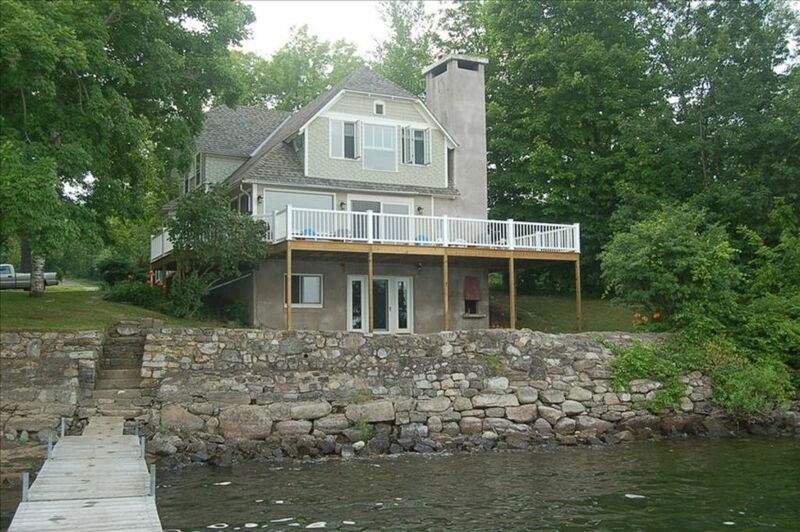 Lakefront house with dock, swim float and large yard on beautiful Lake Champlain. Mooring available. Walking distance to town. Perfect for a family reunion or to share with another family. The sixth bedroom is a studio apartment in the basement looking out on the lake. A 6 burner commercial Garland stove makes cooking for a large group a joy. The large dining room table inside can comfortably seat 12 and if you cozy up, 17. Outside there is seating for 18 on the brick patio. Beautiful lake views from the living room and deck. Den can serve as an extra bedroom with a Q sofa bed. Master bedroom has a queen and twin, bedroom 2 has one double and one twin, bedroom 3 has one queen, bedroom 4 has one full, game room has three twins, one is a roll out. Lower level studio apartment has a queen and a twin, a full futon and a twin futon. There are also two large sofas in the living room that have provided additional sleeping space when there is over-flow. The gaming room has a ping-pong table. Sit on the deck, relax and enjoy the beautiful lake. outdoor shower, View the lake while showering. Westport, New York is a small Adirondack village overlooking the Lake with its own P.O., library, marina, golf course, small grocery store, hardware store, arts and crafts, plus dining. The large, open-plan living room and deck affords a beautiful view of Lake Champlain and the Green Mts. of Vermont . The Lake, which is accessible from the end of our lawn, provides ample water activities. A dock runs from the shore and provides fast access into the lake for swimming etc. Views of Vermont's Green Mountains across the lake featuring Camelshump and Mount Mansfield. The beach is a little rocky but different every year. Water shoes are highly recommended to protect against zebra mussels . Linens provided. Beds will be made. Towels are provided. We ask that you wash, dry, and fold towels your last night. Commercial Garland with 6 burners and a griddle, one oven. 2 acre lot with perennial garden, small swing set and sand box. Westport Country Club, 18 hole, championship golf course 1/2 mile away. Great place for a large family vacation. We had a great time. Beautiful views, great location, plenty of room for our family of 14. This house was incredible! From the beautiful lake views to the everything you could possible need in a home. Our family of 9 & 2 pups enjoyed everything the house offered. The 6 bedroom areas and four baths made it easy for everyone to have somewhere to relax In peace. The kitchen has everything you need, the deck table was perfect for family meals and the fire pit made evenings fun for the family to gather around. Anne is delightful and if you are looking for a place to stay then this it! The lakehouse was great! Everything was very clean and plenty of room for everyone. We had a great time! There was a big yard with a fire pit. We played volleyball, kayaked, canoed, fished and swam in the lake. Ausable Chasm was only 35 minutes away and was a great place to visit. We also went into Vermont for a shopping trip with our girls. The lakehouse is big and charming and plenty of room for everyone. I loved the big commercial stove with the griddle top, it was great for making breakfast for our large group. Thanks Annie!! It's not easy to find a lakeside rental with five or more bedrooms, so we were very glad to find this house in Westport, NY. The kitchen is well supplied. There's a generous side yard with a swing set and a fire pit. We made good use of the canoe. The house is well-maintained; the owner and staff are very helpful. I was pleasantly surprised to learn that Vermonters with fishing licenses don't have to buy another one to fish on the New York side of Lake Champlain. We took side trips to Ausable Chasm and Fort Ticonderoga. Altogether a wonderful experience. We have rented Lakeside for the past ten years for two weeks each time. It has been the perfect gathering place for extended family and friends. Beautiful setting, clean, spacious, the house and the property have something for everyone.The owners are available for questions, are friendly and accommodating. They keep the property fresh and upgraded whether by adding a new dock or a freshly painted room-it is fun to see the subtle, tasteful changes each year. The location is perfect! Westport affords easy access to out door fun- on the lake or in the mountains, yet a ferry ride or mountain drive can bring you to interesting cities of Burlington or Lake Placid. Local airports are convenient for people to fly in for a long weekend. Though there is so much to see and do in the area, this property is so delightful that once we arrive we tend not to leave. Vacationing at Lakeside is the highlight of our year. My favorite kind of place! We arrived to find the windows open and doors unlocked, how refreshing. The house has so much character which we love and enjoy. We appreciated the fact that this retreat has been much loved and used. The house is quite large and proud of itself. It has a camp-like feeling and natural but is most comfortable and well-equipped. The huge stove and griddle was the gathering place in the mornings for our family breakfasts. Such fun. Fort Ticonderoga is a 45 minute drive south and provides a rich history of the area. Lake Placid, 1980 Olympics venue, is 45 minutes away and offers an array of bars, restaurants, activities and shopping. The Adirondacks offer great hiking opportunities while the Champlain Valley is one of my favorites areas for road biking. You can reach Burlington, Vt. by taking the Essex Charlotte ferry. This college city is a great place to dine, shop and enjoy performing arts.